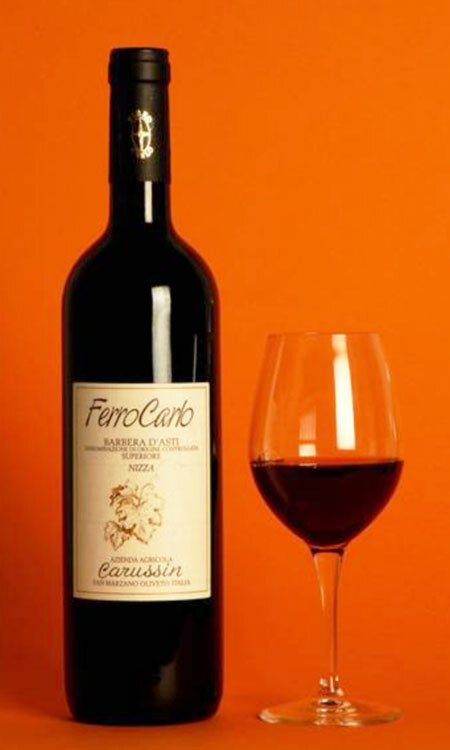 The Barbera d’Asti Nizza “Ferro Carlo” is the top wine of Carussin and just a few thousand bottles are produced. Production area: Town of San Marzano Oliveto, typical area of production Nizza. Vineyards: Towns of San Marzano Oliveto and Nizza Monferrato. Pruning system is Guyot. Planted in the years of 1951 and 1975. Working techniques in the vineyards: Pruning leaving 5/6 buds. Activities in the vineyardsare guided by a modern Biodynamic method, vineyards are certified organic by “Solo e Salute”. Manual grass mowing. Harvesting: Manual harvesting with baskets, followed by analysis of maturation, generally in the second week of October. Deep ruby red colored with shades of violet. Full and structured taste of ripe red fruit, with time the goudron intensifies and pleasant tastes of light roasted coffee and licorice reveal. It has great persistence and elegance. The sub-appellation Nizza under Barberad’Asti appellation is a synonymous of a restrictive specification that includes just 18 towns of the south of Asti. The rigorous specification defines mainly sun exposure of the vineyards. It restricts grape production around Nizza Monferrato only in areas facing south, southeast or southwest and at 280 meters over sea level. The wine is made with soft pressing and long extractive maceration. Malolatic fermentation in the autumn favors its natural stabilization during ageing which is 30% is in small barrels of new French oak and 70% in big barrels made of Italian oak for a total of 18 months, for then age in the bottle. A careful tasting of experts reveals its debut. Longevity: its great structure makes it a proper wine for long ageing. The Barbera d’Asti Nizza “Ferro Carlo” is Carussin’s grand wine and just a few thousand bottles are made. Vintage 2002 was not made, the grapes of that selected Barbera gave us the great “La Tranquilla” 2002. The name Ferro Carlo is a tribute to fundamental character of the farm, who, despite of the opposite opinion of the family, alreadyin the ‘70s fiercely believed in quality over quantity. The Barbera d’Asti Nizza “Ferro Carlo” pairs with prestigious dishes, wild meat and herb cheeses.